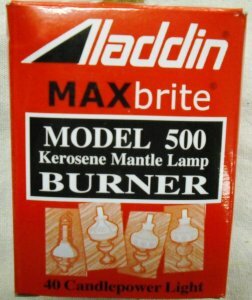 The Aladdin MAXbrite model N500B is a refinement of the Aladdin model 23A burner. The primary changes in the burner were to maximize light output with the 40 candlepower LOX-ON mantle and to eliminate random air leaks that has plagued model 23 production since the Model 23 England burner was discontinued. Some model 23 and 23A burners had air leaks in the burner that caused flame spikes. The MAXbrite burner eliminates those spikes which kept mantles from being used at full brightness. The Aladdin MAXbrite burner is a clear improvement over the Chinese manufactured model 23 and 23A burners.